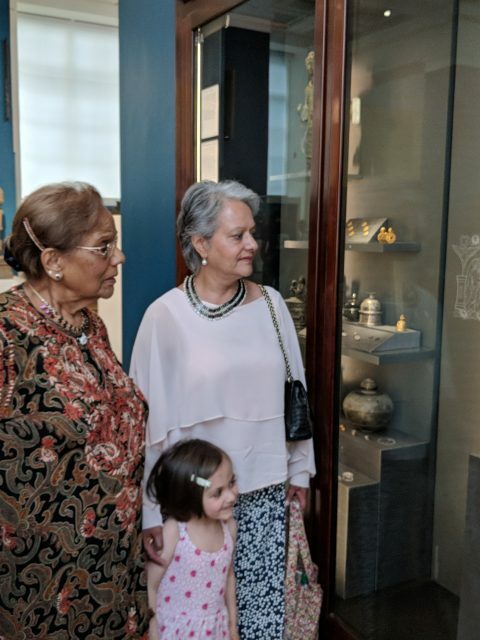 The refurbishment of the Sir Joseph E. Hotung Gallery for China and South Asia was an opportunity to reassess the full scope of the narrative and objects on display relating to the history of South Asia. I worked on the ancient to medieval half of the South Asia section, including Gandhara. I dedicated an entire section to Gandhara in the Hotung Gallery because of the size and importance of our collections from this region; the fascinating history of this period in northwest South Asia; and the intriguing stories behind the collection of the material during the 18th century to the early 20th century. It wasn’t an easy section to curate: the many hundreds of objects from Gandhara permit infinite permutations of objects within different narratives and themes, and this vast body of material had to be narrowed down to a core selection displayed with a clear, easily understood message. While embarking on the process of looking at, thinking through and researching the collection, I was in the fortunate position of being able to draw on the wealth of expertise of Elizabeth Errington and Joe Cribb. Their help and guidance in this section was invaluable. Two large mahogany cases, which are part of the original architecture of the gallery, face one another in each Bay, with a floor-to-ceiling window in between. 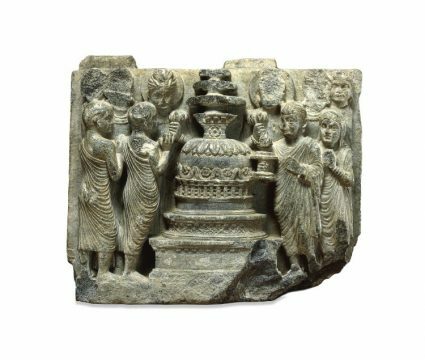 I dedicated the right hand case to the architectural components that make up a stupa (which I will discuss in a separate post), and the left hand case to the life of the Buddha and the reliquaries discovered inside the Gandhara stupas. Here, I focus on the left hand case. The case is divided vertically into three parts. In the right hand section, I included a selection of narrative panels depicting key moments in Sakyamuni Buddha’s life. 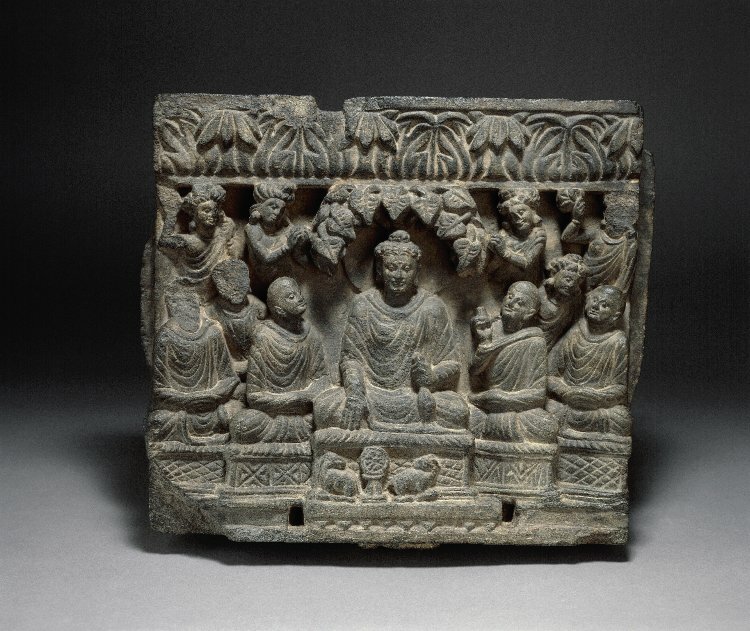 The panels introduce our visitors to the historical Buddha, including the complex debates concerning the year of his parinirvana, and also contextualise the reliquaries displayed in the adjoining parts of the case. 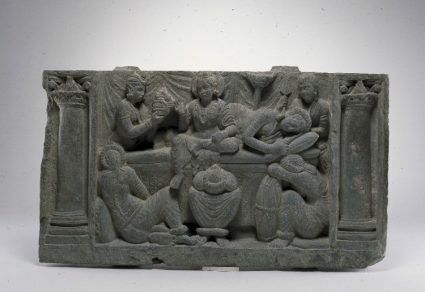 Prince Siddhartha’s conception (1), birth to Queen Maya in Lumbini (2), renunciation of his luxurious, princely lifestyle to seek enlightenment (3) and his departure from Kapilavastu, the city where he grew up, to this achieve this (4). 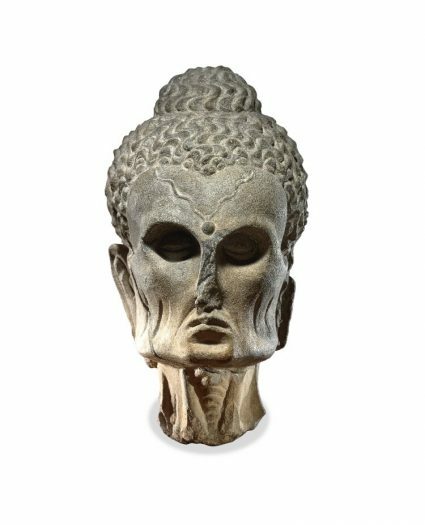 The harsh austerities he subjected himself to are vividly reimagined in a sculpture showing the fasting Siddhartha’s emaciated face (5). After abandoning extreme asceticism, he achieved enlightenment under the Bodhi tree, thereby becoming the Buddha, The Enlightened One’. He gave his First Sermon at the deer park in Sarnath (6) before travelling across northern India spreading his teachings about dharma. 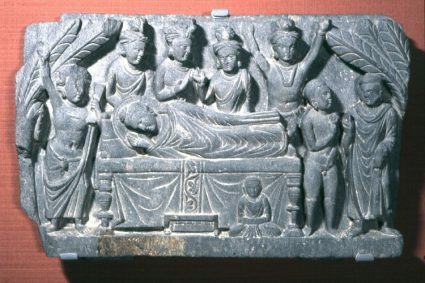 The Buddha passed into parinirvana, the final nirvana (liberation from rebirth) at Kusinagara (7). According to Buddhist tradition, following his bodily death and cremation, the remains were divided into eight parts (8; see what I did here?! ).These relics of the Buddha, as well as the ashes of the funeral pyre and the bowl used to collect the remains, were enshrined in stupas where they were venerated (9). The stupa drum (circular base) was often decorated with panels carved with scenes from the life of the Buddha. The narrative of the Buddha’s life progressed in a clockwise direction, following the course by which worshippers circumambulated the stupa in order to gain merit. While looking at these sculptural panels, it is important to remember that they were once part of structures at the heart of active sites of worship in ancient times, and also that the monks, nuns, pilgrims and other worshippers would have been able to decode the scenes depicted in the panels they encountered during their visit to the stupa. The scenes depicted in the panels tended to follow a set format which generally makes these moments quite easy to identify. Panel 6 above, for example, depicts the First Sermon. Here, a dharmachakra (dharma wheel; one of the oldest Buddhist symbols) is flanked by two deer beneath the seated Buddha. The deer represent the Deer Park in Sarnath where the Buddha gave his first sermon and, when he delivered this sermon, he was said to be setting the dharmachakra into motion. 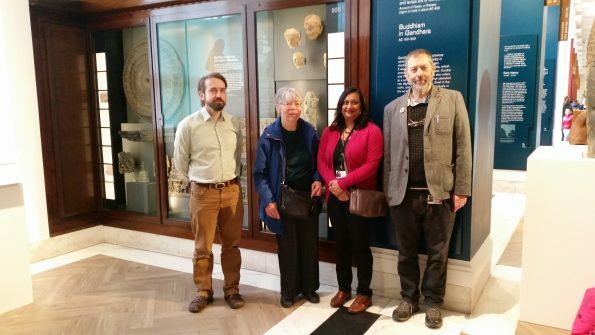 The British Museum has a very good collection of reliquaries from Gandhara, Greater Gandhara, Sanchi and environs and also some from Andhra, and I wanted to display as many of them as I could. While most of the Gandhara reliquaries are grouped together in Bay 3, those from Taxila and the Great Stupa at Manikyala are displayed in Bay 2. Overall, these examples cover most of the reliquary types discovered in this region in terms of shape and material. Where their contents survive, I have also included them in the display. Among the reliquaries, there are some which are so important that they must always be on permanent display. 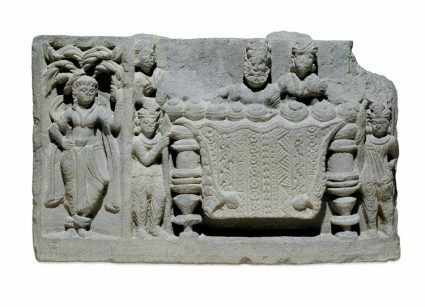 The Bimaran Casket is prominent among these because it bears the earliest datable representation of the Buddha in human form. I placed it at the very heart of the case to the left of the Bay so that it would catch the attention of visitors as they walked through the gallery. 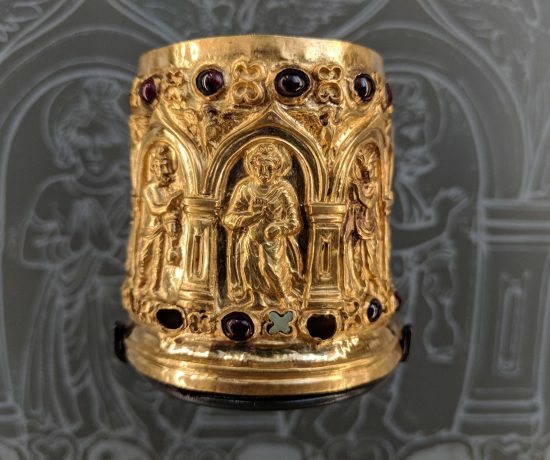 I have written about this particular reliquary in some detail in a separate blogpost, so here I will focus on its display. 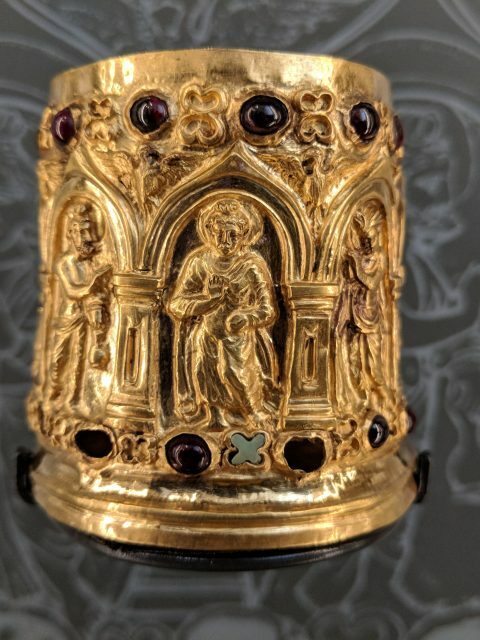 It was quite a challenging display because both the gold reliquary and the stone casket in which it was found, are very small, as are the numerous beads discovered with them. The four coins which help to date it are not only small, but a dull bronze colour making it difficult to make out the details on them. On the plus side, the Bimaran Casket is made from gleaming gold inlaid with garnets and turquoise and, as we know, precious metals and gemstones attract the eye. Queue a lot of brainstorming about the display. Ideas that were rejected included: displaying the gold reliquary on a rotating stand so that visitors could see all sides, and placing a mirror beneath it to show the beautiful lotus base. 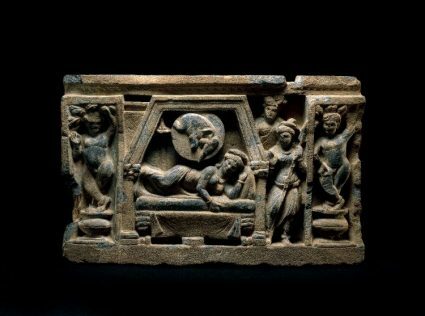 While such approaches work well for some objects, I thought they had the potential to detract from the central figure of the Buddha on the casket. So, the final display focuses on the gold casket but also includes the rest of the deposit. Because of its size, it is difficult to make out all of the details on the casket, and it is not immediately apparent that there are four individual figures depicted twice around it. So, a large-scale version of Elizabeth Errington’s drawing of the unfolded casket was printed on the panel behind the casket. The casket is securely held in place and, crucially, the beautiful lotus-flower base is not obscured. However, you do need to look up at it from below because it proved difficult to display it in such a way that the base was easily visible – I even tried using a large-scale image of the base as a back-drop! 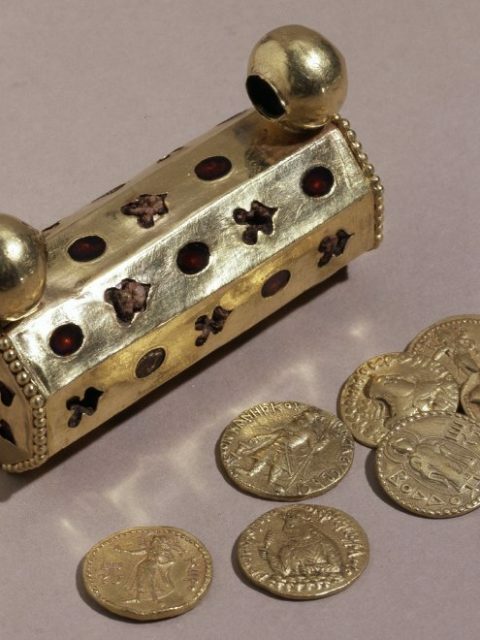 Beneath the casket, the beads, gold ornaments and fragment of a seal ring are displayed in a clear acrylic container. Although it would be wonderful to show these objects resting on the grey silk which covers the plinth, practical considerations made this option inadvisable: the beads are so small that if you were to breathe on them, they would scatter. Not ideal! 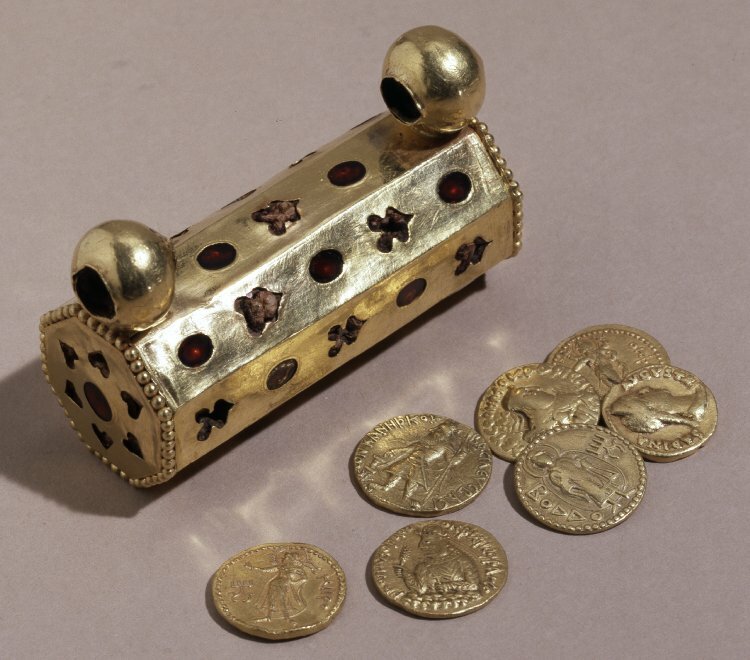 The coins are displayed separately for three reasons: firstly, they are a key part of dating the casket and discussed in the panel text above, so their importance needed to be highlighted visually; secondly, they were not found inside the stone reliquary like the small beads and other ornaments, but were placed next to it within the relic cell of Bimaran Stupa 2; finally, by pinning them to a slope, the detail on these dark bronze coins could be picked out by the sweep of the lights fixed above them. The stone casket is displayed on a separate plinth at a lower level than the gold reliquary, beads and coins. This way, the Prakrit text written in Kharoshthi script written on the lid and body of the reliquary can be seen more clearly. The reliquary is displayed in such a way that not only can you see the script, but also two labels on it: ‘5’ and ’10’. These labels are an important part of its history: they were affixed to the reliquary when it was held in the East India Company’s India Museum in Leadenhall Street, City of London, before it was transferred to the South Kensington Museum (‘V&A’) and, later still, the British Museum. My curatorial preference is to keep intact any labels, registration numbers and other text added to an object after it was discovered because they relate to moments in the journey of the object after it was discovered. Future curators and researchers may thank me! While stupas were large, obvious centres of public worship that some of our visitors may be familiar with, I wanted to show them that there was a more personal aspect to Buddhist devotional practice as well. 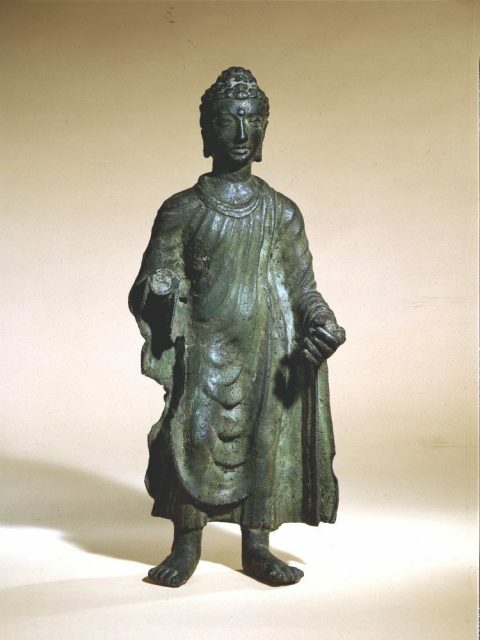 It was for this reason that I displayed a metal Buddha image alongside the Gandhara reliquaries. Copper alloy Buddha images were portable and may have been used for personal veneration purposes by members of the monastic or lay community. 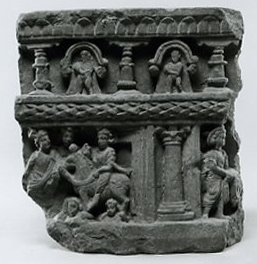 Examples from Gandhara are also exceedingly rare. While I was working on the gallery project, I did some research into how many of them survive, and, if I recall correctly, I came across about thirty-four examples in museum collections around the world. Of these, the British Museum is fortunate to have two standing Buddha images. One dates to c.AD 5th-6th century (reg. no. 1958,0714.1), while the other dates to c.AD 5th-7th century (reg. no.1981,0610.1). As you can tell by these long date ranges, it is not especially easy to date them. 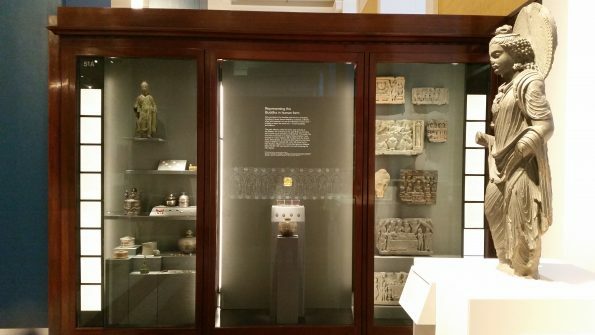 Given the rarity of these images, I was keen to include both among the gallery displays, but didn’t want to place both in the Gandhara section. This is because they are strong enough individually to hold their own visually and historically alongside a range of objects in different contexts. 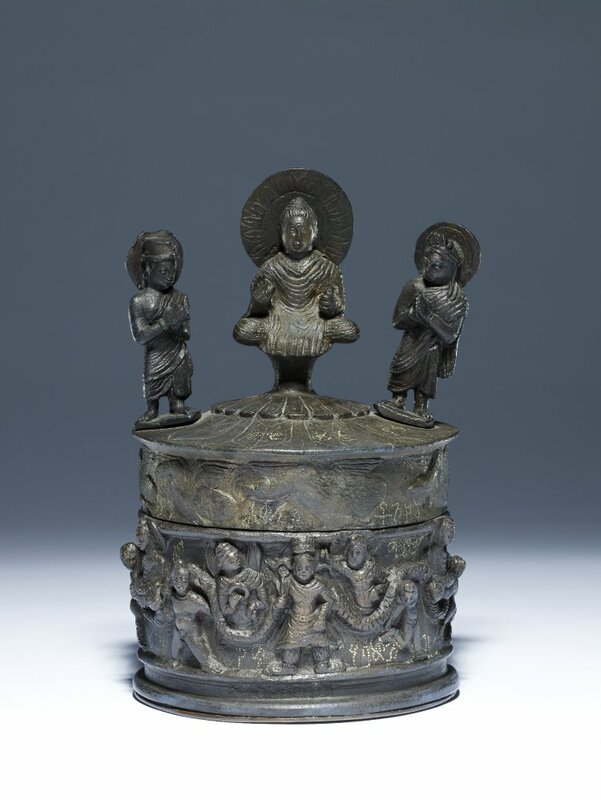 So, the earlier example is displayed above a selection of reliquaries on the left hand side of the Gandhara Bay, while the later figure is shown alongside early Buddha images from Mathura in the neighbouring Gupta Bay (I will blog about this section separately). A wide variety of reliquaries were deposited in Gandhara stupas and we have excellent examples of most of these types at the museum so it was a no brainer that I’d include them in the gallery. 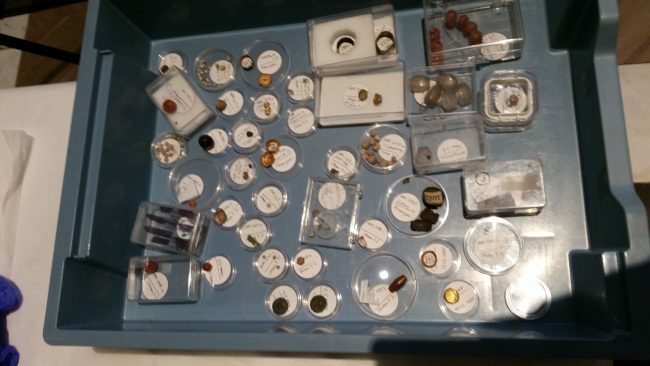 At first, I wondered if we could group all of the reliquaries together in a tall, glass-sided Hahn case that would sit towards the front of the Gandhara section. This way, you would be able to see the reliquaries from all angles. But, this was impractical: it would obscure the 3 tall sculptures in front of the window and you wouldn’t be able to stand back and see the exceptional collection of Gandhara sculpture and reliquaries on display. So, I placed them all together in the section next to the Bimaran casket and beneath the metal Buddha image. One is this stunning – and surprisingly large – gold amulet inlaid with garnets that was found at Ahin Posh, Afghanistan with 17 gold Kushan coins and 3 gold Roman coins. 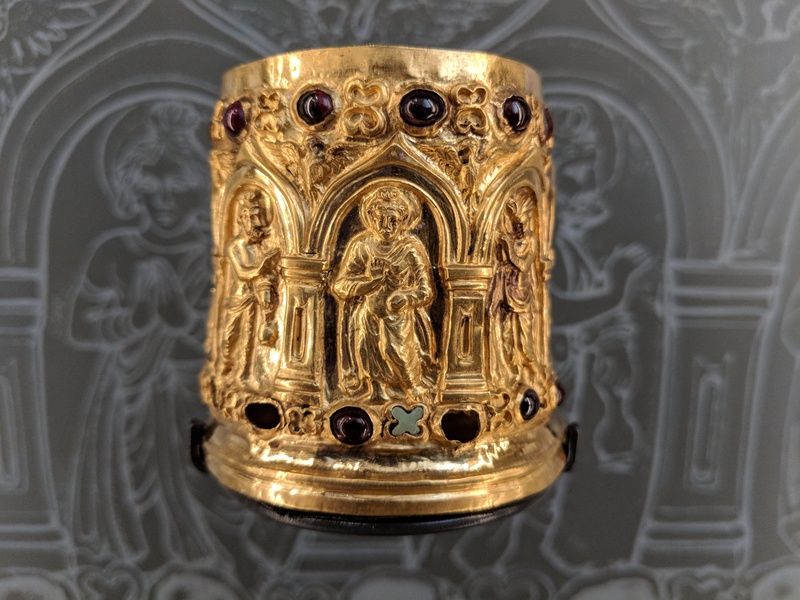 The presence of this amulet at the very top of the section of reliquaries immediately informs our visitors that not all reliquaries look as they may expect: they come in a variety of shapes, sizes and materials. It makes the important point that many objects were repurposed as reliquaries. I didn’t want to disturb the display by adding in a photograph showing a sculpted figure wearing this type of amulet, so instead I included this information in the label and if the visitor turns their head to the right, they will see the large figure of Maitreya wearing exactly this sort of amulet across his chest. There is a final point which may also surprise some people: 3 gold Roman coins of Domitian, Trajan and Sabina were included in the deposit alongside 17 gold Kushan coins, which included the very rare and very famous ‘Boddo’ (‘Buddha’) coin issued by Kanishka I (AD 127-150). 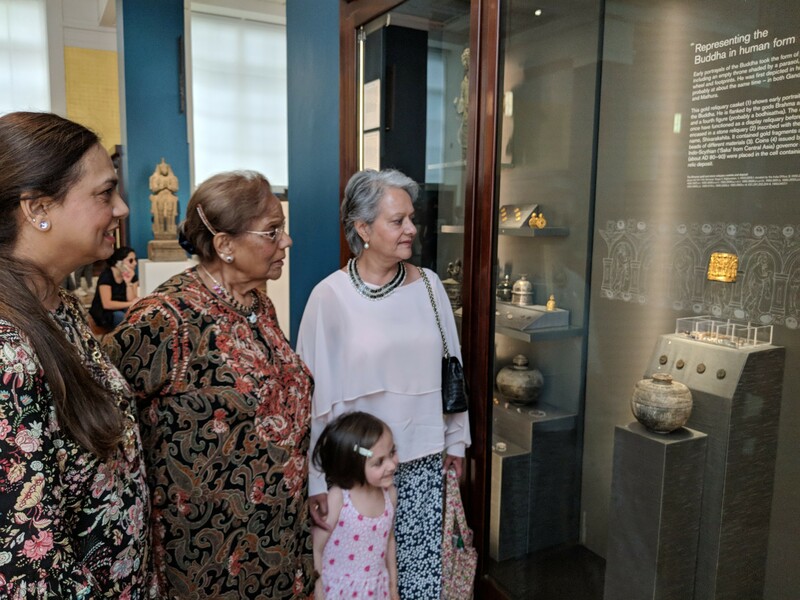 The ‘Boddo’ coin is not on display here – it is such an important object that it really needs to be highlighted in and of itself, and it travels the world in exhibitions, too. 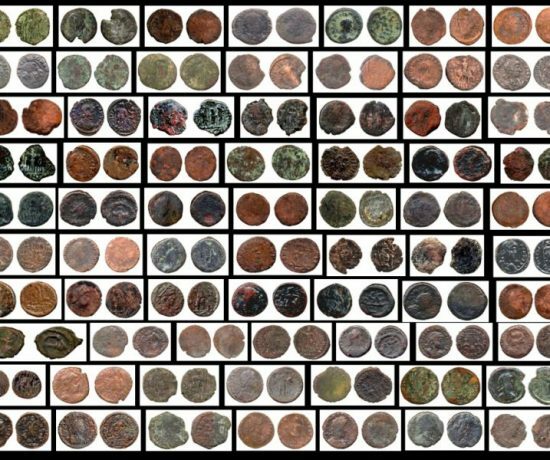 The presence of these coins develops a point first made in the Indo-Roman trade section, namely, they provide evidence of the long-distance trade between north-west India and the Mediterranean world, while also showing that objects were repurposed in new cultural contexts. 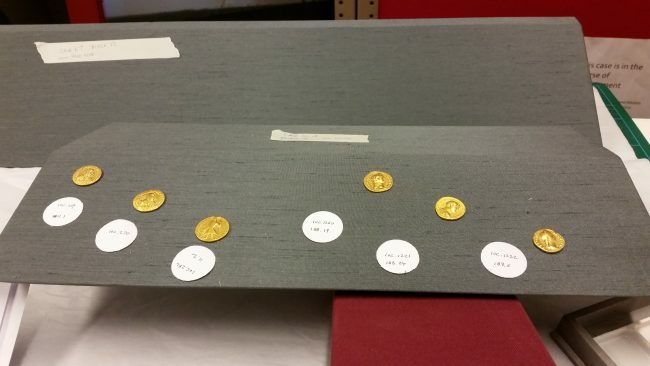 Instead of placing 6 coins on the shelf by the reliquary, they are pinned on a slope next to it so that people could see the coins more easily. The other is an electrotype copy of the so-called ‘Kanishka’ reliquary. 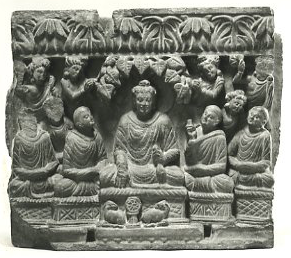 On the top, the Buddha is flanked by Brahma and Indra – just like on the Bimaran Casket – while on the side, a king, possibly Kaniskha I, is depicted wearing Central Asian clothing. The original reliquary was found inside the Shah-ji-ki-dheri stupa, near Peshawar, during excavations conducted at the site by the American archaeologist D.B. Spooner (1879-1925) in 1908-09. 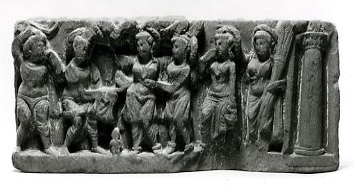 This was just one of the many Buddhist sites Spooner excavated while working for the Archaeological Survey of India, and he also excavated at Patna, the location of the ancient Mauryan capital of Pataliputra. 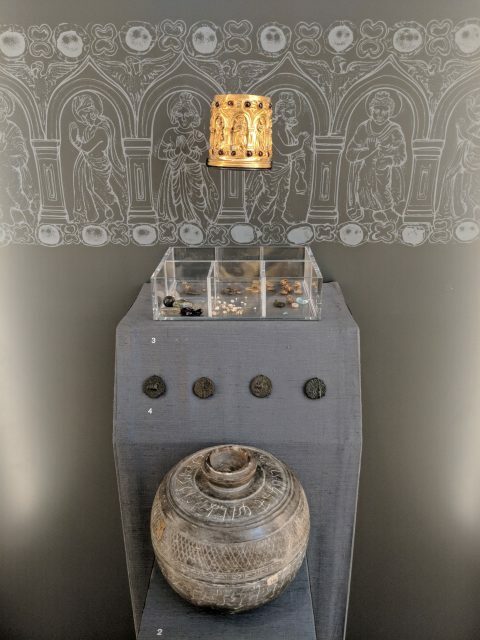 As with the amulet above, this container was repurposed as a reliquary, although in this case it had not been a religious object: the inscription tells us that it was originally a perfume casket and that it was donated by two architects. Notably, the bone fragments found inside were sent to Burma, where they still are. The original reliquary is held by the Peshawar Museum and in the mid-20th century it travelled to the British Museum for conservation work. As requested by colleagues in Pakistan, two copies were made: one returned to Peshawar with the original reliquary, while the other was gifted to the British Museum in thanks for the work undertaken. 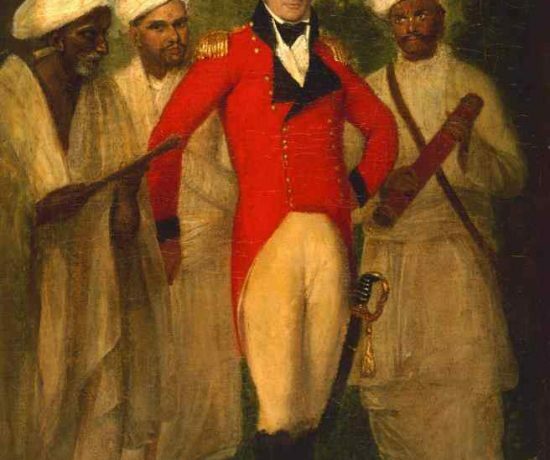 It is so important to recognise that there is no display without a huge amount of work by experts in their respective fields: conservation, mount-making, installation… to name but a few of the processes involved. This was not an easy section to install: the stone sculpture is much heavier than it looks, while the metal reliquaries are extremely delicate and the deposits are tiny and easily scattered. Thankfully, I was fortunate to work with very talented colleagues and they did an exceptional job. There are so many people involved in a project this size and during the truly epic gallery installation, I took a lot of photos – with permission! – of some of the people who heroically rose to the task of conserving, mounting and installing thousands upon thousands of different objects. And not to forget the person who came in and numbered every single display. Two things stood out for me: pinning the gold coins in two diagonal rows draw your eyes immediately to the amulet reliquary. Simple, but effective display approach. Also, placing tiny labels beneath the tiny metal reliquaries makes it much easier to identify and differentiate between them when it comes to looking for these specific objects. After the gallery reopened, it was a real privilege to show the new displays to the many people who had helped and supported me in different ways. A particular highlight for me was when Liz Errington, Joe Cribb and Robert Bracey came over. It was such an exciting and emotional moment because years before, Liz had taken me on as a volunteer and I learned so much from her, Joe and Robert during this time. Not only that, but they helped and guided me in subsequent years, including with aspects of this display. I owe them an enormous debt of gratitude and it made their visit to the gallery even more special for me.